Al Ain: A place that transports a person back in time is rare. Mezyad Fort is, however, an exception. It stands tall in the foothills of the majestic Jebel Hafeet, in a salute to its unknown builder. Located some 25km in the east of downtown Al Ain and close to Jebel Hafeet Tombs, the fort, built some time in the 19th century takes visitors back to the world of Arabian romance — full of legend and mystery. The visitor may almost expect to see traditional Arabian merchants coming from a far off city along with a caravan of camels loaded with merchandise. The fort is imposing and, perhaps, the only one that has such a powerful surrounding. What makes it so special is the mighty Jebel Hafeet that stands high in the background. It is also surrounded by date palm trees, a fine view of which can be captured from the fort’s pinnacles. The fort is situated right at the border of the UAE and Oman at the outskirts of the small town of Mezyad. 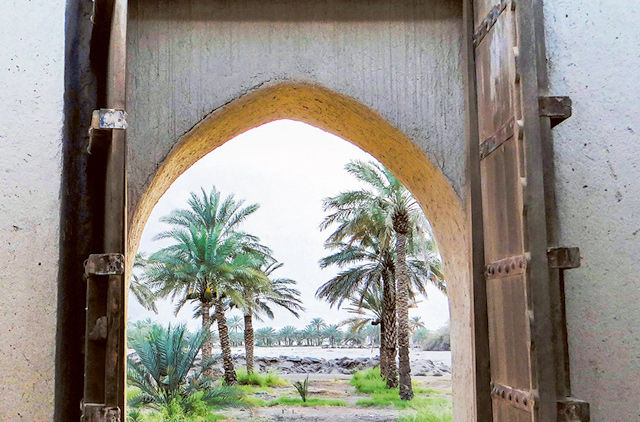 “Mezyad Fort commands a strategic location dominating the beginning of the route that leads from Al Ain along the western flank of the Hajar Mountains to Dhank, Ibri and Nizwa,” said an Abu Dhabi Tourism and Culture Authority (TCA-Abu Dhabi) official. It is similar in size and layout to Jahili Fort, said the TCA-Abu Dhabi official, which suggests it is contemporary to it and would date from the period of Shaikh Zayed Bin Khalifa Al Nahyan’s growing ascendancy over Al Ain at the end of the 19th century. “As with Jahili, Mezyad Fort fulfilled two functions, guarding a key strategic area and being a demonstration of power that was intended to overawe the hostile tribes in the neighbouring village of Hafeet,” he added. “The fort really encapsulates the past,” said Jeremy Rayon, an expatriate visitor. It is, unfortunately, neglected as there are no signs on the road to guide tourists to it. “It looks like the authorities have no plans to make it a tourist attraction,” he said. Rayon and his friends recently set off on an adventure to find the fort and discovered it hidden behind the closed doors of a compound that looked more like a farm. A number of people who visited the fort said an atmosphere of neglect surrounds the place. Mudbricks are littered around. Dry mud and piles of sand and roofless rooms on the two sides of the fort indicate restoration work was abandoned half-way through, perhaps, several years ago. Abdullah Salem Al Nuaimi, a 65-year-old Emirati resident of the town, said the fort was very old. Constructed with mudbricks, it has three symmetrical watchtowers on the three sides of the courtyard. This heavily fortified building was, apparently, designed to provide shelter to families and hold a large number of troops, weapons and food. According to Al Nuaimi, Mezyad Fort was also used by the Trucial Oman Scouts. The scouts’ headquarter was in Sharjah and they used the fort as an outpost in 1950s. The fort is apparently closed to the public but is still accessible as there are no guards or signs showing that it is prohibited for visitors. The doors are open but it is clearly not a picnic spot at the moment. A sand viper was seen lying dead in the courtyard. The area in and around the fort is ideal for such snakes. People are not advised to visit the fort until its restoration is complete and officially opened for visitors. 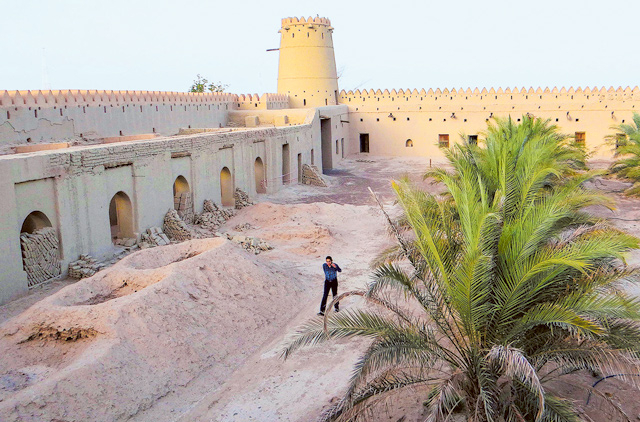 Al Nuaimi said Mezyad Fort has an ideal location that can easily be converted into a cultural and historical hot spot. “I would recommend authorities to organise a festival of Arabian culture at the fort, reincarnating the centuries-old lifestyle that was once found around the fort,” he added.